This was first featured on Space Wolves Blog in 2011 which is now lost to the warp. In an effort to retain the information we have republished it here. Points values may have changed. As far as Space Wolves special characters go, Logan Grimnar tactics are anything but straightforward. 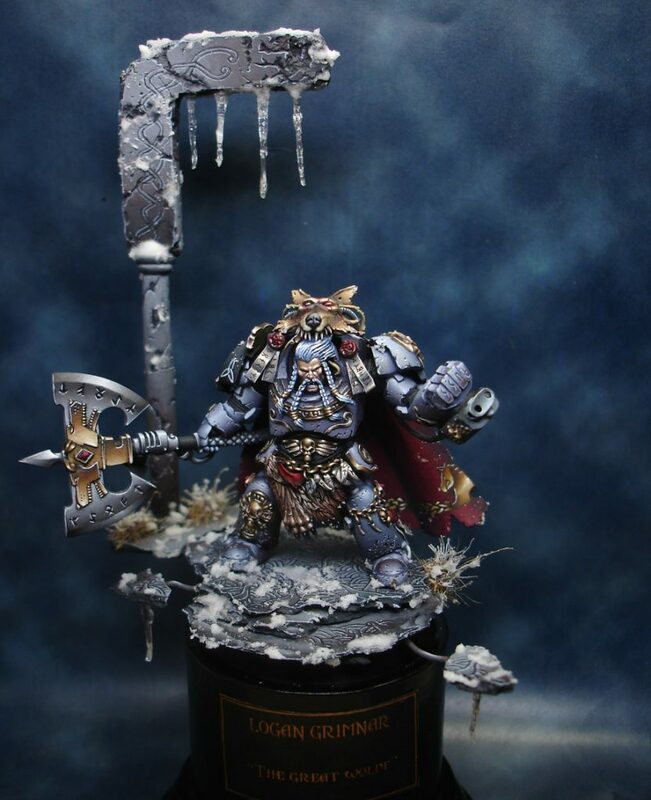 Chapter Master of the Space Wolves, Logan Grimnar is as hard as nails, hefting the mightiest of axes while enhancing the warriors around him with all manner of special abilities. The perfect embodiment of the Space Wolves’ playing style on the table top, he’s good at everything without being great. Like the rest of the army, he’s a supporting unit who in turn needs support from other elements of the force to function effectively. But, if you can support Logan while he supports the rest of the force, you’ll achieve a stronger army overall. Equipment: Terminator Armour, Axe Morkai, Storm Bolter, Belt of Russ, Wolftooth Necklace, Wolftail Talisman. Skills: Living Legend, High King, Stubborn, Eternal Warrior, Great Wolf, Saga of Majesty. Unfortunately, due to his compulsory suit of terminator armour, Logan Grimnar has trouble fitting into most transports and as a result, most units. This means that there are only a handful of units in the Space Wolves army that he’s suitable to lead. These include Wolf Guard, Grey Hunters, Blood Claws and Long Fangs. Logan Grimnar can use his Axe Morkai as either a Frost Blade or a Power Fist and you can split his attacks between the two. Also, thanks to his Wolf Tooth Necklace, he always hits on 3+ in close combat. While many people tend to use all his attacks as a Frost Blade when he has a higher initiative than his opponents, or a Power Fist when he has a lower initiative, splitting his attacks between the two types also yields certain benefits. Of course this depends on what the squad he’s leading is armed with. In the case of leading Grey Hunters, he could make a couple of Frost Axe attacks, followed in initiative order by the Grey Hunters, then add to the Power Fist attacks of the Wolf Guard leading the Grey Hunters at the end of the close combat, allocating individual Insant-Kill wounds on many more models within a unit. It’s a great way to kill off any Independant Characters or specially equipped models (Blood Angels Apothecary) more efficiently. Foe bashing tactics aside, the real key to succeeding with Logan Grimnar comes down to which unit he’s leading. So once we add Logan Grimnar to the mix, we get a special character who gives the whole pack access to the Tank Hunter and Preferred Enemy abilities. Tank Hunter is great for all the combi-meltas and combi-plasmas. Likewise, it’s great for the cyclone missile launcher. Meanwhile Prefered Enemy gives the small, elite pack armed with power weapons some serious combat clout -especially when Logan uses his once-per-game Living Legend ability. The only downside is the limited room in Space Wolves transports which will often see the Wolf Guard Terminators losing their heavy weapon as they’re forced into a 4 man squad to accomodate Logan Grimnar in a Drop Pod or Land Raider. However, there’s plenty of room in a Land Raider Redeemer and for maximum numbers a Land Raider Crusader can carry 7 terminators and Logan. But that’s a lot of eggs in one basket at approximately an 800 points. Logan and the 4 Wolf Guard Terminators in a regular land raider comes to roughly 650pts by comparison. To get the best from Blood Claws you need 15 of them with 2 melta guns led by a Wolf Guard. Normally we have a Wolf Priest with them as well, but Logan nicely fills this role and does it a bit better. Unfortunately there are too many models to fit inside even a Land Raider Crusader, but that’s not really what Blood Claws are for. They’re there to cause a big distraction, soak up lots of firepower, run straight towards the enemy and cause lots of carnage. Logan’s ability to give the unit he leads Preferred Enemy obviously benefits the Blood Claws with Beserk Charge. If he uses his once-per-game Living Legend ability, the +1 attack for every model could give the unit some serious clout. But it all depends on how many Blood Claws you can get into close combat after taking the full brunt of the enemy’s firepower. Based on previous experience, not that many seem to make it. Want to cut the numbers down a bit and cram them all into a Crusader? That’ll be 800pts please. Once again, not cheap! Combined with the re-rolls of a Wolf Standard, Logan Grimnar leading a pack of Grey Hunters is an awesome prospect. Unfortunately, you’ll need a Land Raider or Drop Pod to get them into position. But we’ve established that with most of the other unit choices already. Logan Grimnar’s ability to confer the Tank Hunter skill to the squad makes all the bolters great for bringing down Armour 10 targets. Preferred Enemy is the obvious choice to give any enemy an extra hard kicking in close combat. Throw in the Wolf Standard for the Grey Hunters to reroll a 1 rolled for the number of Wulfen attacks, to wound rolls and armour saves and you can have a devastating round of combat. Use the once-per-game Living Legend ability and they all get +1 attack with said rerolls at the same time. Now that’s pretty tasty! Finally, there’s the overlooked skill ‘Relentless’. This lets you rapid fire all those bolters before charging into close combat, especially if disembarking from a Land Raider. For all this you’re looking at just over 700pts. Compared to Logan and 4 Wolf Guard Terminators in a Land Raider for 650pts, this doesn’t seem too bad. When the new Space Wolves Codex was released, everyone wanted Logan Grimnar leading their Long Fangs jumping out of Drop Pods and firing off their multi-meltas. It’s a no brainer choice for getting into the thick of things, but can the Long Fangs take much of a beating in the thick of close ranged combat? Probably not. Relentless, Tank Hunter and even Prefered Enemy have their part to play when Logan Grimnar leads a pack of Long Fangs. All you need to do is choose your heavy weapons, what to equip a Wolf Guard with and which method of transport will be best. That comes to just under 500 points. This unit can ride in a Land Raider or simply walk up the board, firing off missiles with Relentless before taking up a good position and turning their skills to Tank Hunters for a healthy barrage of 8 krak missiles with +1 to the armour penetration roll. No one’s going to want to charge them with Logan leading them. But is the Great Wolf wasted in this capacity? Considering that the Space Wolves army seems to thrive on securing the midfield, this could be an excellent central unit. Get them in the centre, surrounded by your Grey Hunters and Logan augments the entire army with his Living Legend ability while the Long Fangs lay down a surpressing fire with their missile launchers. If this tactic sounds risky, then maybe it’s worth giving the Long Fang Sergeant a power fist for good measure? He does have the same stats as a Wolf Guard after all. More aggressive players have tried to pair Logan Grimnar with a pack of Long Fangs all armed with multimeltas for the same points. This doesn’t seem to fair any better against tanks outside of 12″ than missile launchers and with a maximum range of 24″, the missile launchers would probably be a better and more versatile choice with their longer range and frag missile options. Is it worth putting them in a Land Raider? They can disembark and fire their heavy weapons -even charge into close combat if need be. It’s not bad, but the Land Raider is a lot of points and anything close combat related with Long Fangs, even if lead by Logan, seems very risky. Logan Grimnar can lead all of the best units in the Space Wolves army, so you’re really spoilt for choice when it comes to placing him. However, he’ll always need to ride in a Land Raider or Drop Pod if you want him to see close combat. But whatever happens, Logan Grimnar is an augmenting character that’s dedicated to close combat. Get him in the middle of your army and let him do what he does best -which is supporting the units around him. Just remember all the skills at his disposal, even the lesser used ones like Relentless and Fearless. They all have their place in the theatre of table top war. Personally, I plan to put him with a pack of Grey Hunters because they can make use of all the High King skills while Logan can make use of their Wolf Standard.